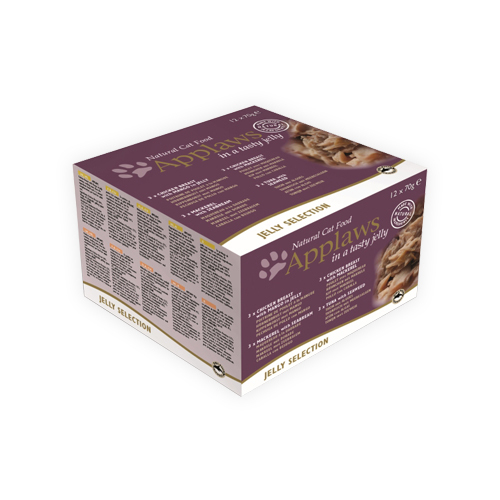 The Applaws Jelly Collection is a combination of four different flavours of wet food in one convenient multipack. One pack contains: Chicken & Mango, Chicken & Mackerel, Mackerel & Seabream and Tuna & Seaweed. You will receive 3 70-gram tins of each flavour. The Applaws Jelly Selection allows you to serve your cat a new flavour every single day. One box contains four different flavours. The ingredients of the food are cooked in a vegetable gelling agent. This food is naturally rich in taurine. This nutrient supports the condition of the eye and is beneficial for the heart. Fresh fish, fresh meat and no artificial colours, scents or flavours; Applaws only uses natural ingredients originally meant for human consumption in the production of this cat food. The Applaws range is packed with fresh fish and fresh meat. This results in dry food and wet food that is rich in vitamins, minerals and Omega 3 and 6 fatty acids, which support your pet’s health. The Applaws Cat Jelly Selection is available in tins of 70 grams. Chicken & Mango: Chicken breast (56%), mango (4%), vegetable gelling agent. Chicken & Mackerel: Chicken (56%), mackerel (4%) and vegetable gelling agent. Mackerel & Seabream: Mackerel (56%), sea bream (4%) and vegetable gelling agent. Tuna & Seaweed: Whole tuna (56%), sea weed (4%) and vegetable gelling agent. Have you used Applaws Cat Food - Jelly Selection before? Let us know what you think about this product. Great seafood selection, incl. prawn and sardines. Actual pieces of fish and whole prawns in a jelly conserve w/o any derivatives. My cat's absolute favourite.